I first became interested in American Football when Channel 4 began coverage of the regular season in 1982. From the off with Big Audio Dynamite’s “The Bottom Line” & later Propaganda’s “Duel” as the opening credit soundtracks I spent many Sunday evenings with my Dad repeating the tackle sounds that were superimposed over the music. He was a 49ers fan (his Sqdn in the RAF), I for my sins supported the Oilers for no other reason than remembering hearing those words from the Apollo 13 news feed “Houston we have a problem” years before. Needless to say, Dad tended to have a smile on his face more than I when the results were read out. 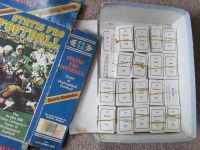 Being a keen wargamer I could often be found with other spotty youths in my local games/hobby shop and during the 80’s was constantly drawn to the rather odd cover of Avalon Hill’s Statis Pro football. It somehow reminded me of Brian Yuzna’s film “Society” with the QB sprouting a second head from his neck. Following the 1986 Superbowl, I finally jumped in and purchased the 1985 Season. From that point on until the early 90’s when girls annoyingly got in the way I began a continual solitaire campaign as it quickly became apparent that the game worked well for solo play. Realising that time would make it impossible to play full seasons (224 games per regular season) I decided just to concentrate on the play-off part of a season which at the time with 2 wild card games would only result in 9 games per season. A game like Statis Pro I imagine, attracts a certain type of player that likes stats. I am no exception, my whole life evolves around spreadsheets to the be/amusement of many who know me. So in the advent before computers it was down to pencil, paper and joy of joy’s square paper. 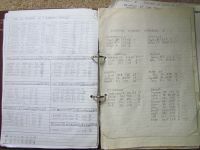 I have kept records of every scoring play since. To begin with I didn’t want to just replay each season with the actual teams that made it that year, rather randomly select and see what match up’s occurred. I didn’t want to spend hours on working out a system so in the end I just used the 1985/86 end of regular season standings and added the win record of each team to a d20 roll. What resulted was failure to qualify for the Giants (historically 14-2) & Cleveland (12-4) while Tampa Bay (2-14), Indianapolis (3-13) and St Louis (4-12) all snuck into my inaugural season. Even more unexpected was Tampa Bay’s 42-10 thrashing of the mighty Chicago in the Divisional Play Off. Dallas ran out eventual winners 62-3 against a shell shocked Pittsburgh in the most one sided game I have ever played. At this stage my record keeping was not as good as I would have liked and although I kept records of who scored I did not record the actual plays. For SBII I used the fictional standings from my SBI campaign with the d20 roll. A new and improved worksheet followed to record the Raiders under QB Jim Plunkett & RB Marcus Allen’s outrageous stats sweep all before them taking the title by beating New Orleans 35-30. After a couple more Play Off seasons I found out that it was possible to buy sets of other seasons. At the time I don’t think all were available so I chose the 1987 cards and from SBV switched to them. I was also aw are that the cards I was using were becoming more outdated historically and consigned to the past as I couldn’t keep up with the real regular season. By the end 1996 I had completed 7 play off seasons using the 85 and 87 sets but was playing far less regularly. Inside the original box is a receipt from Avalon Hill in December 96 for another card set the 1989 one. It was now taking me years to complete just a few games when in about 2004 I finished a game and put the box away where it remained untouched until this month 15 years later. Time has not been kind to the box or the contents. Some cards have nasty rubber band perish stains on them and the rules needed a spot of laminating (another guilty pleasure) as they had completely separated, but apart from that the game contents are complete. I still have to pinch myself that this has actually happened. Over 2.5 years in the making from my original email to the Parish Council leading to my involvement and determination to push this through. I am so proud of the parishioners who donated so generously to this cause that I hold so dear. Those dark days walking on my own a 30 square mile parish through mud and snow with begging letters seem like a distant memory. Even back then, the future England Manager clearly had a penchant for waistcoat’s (and blue shirts). Circa 1992 or 1994 Crystal Palace end of season Player of the Year disco at “Crystals”. Note below, the sartorial lengths Mr Southgate has gone to by unbuttoning the bottom button after Edward VII’s innovation thanks to his ever expanding waistline or dandy Beau Brummel’s habit of wearing 2 waistcoats and wanting his admirer’s to the see both articles of clothing.